Chipmaker DisplayLink partnered with HTC for quite the demonstration of wireless VR at E3 2018. DisplayLink is powering HTC’s upcoming official wireless adapter for the Vive Pro and Vive. 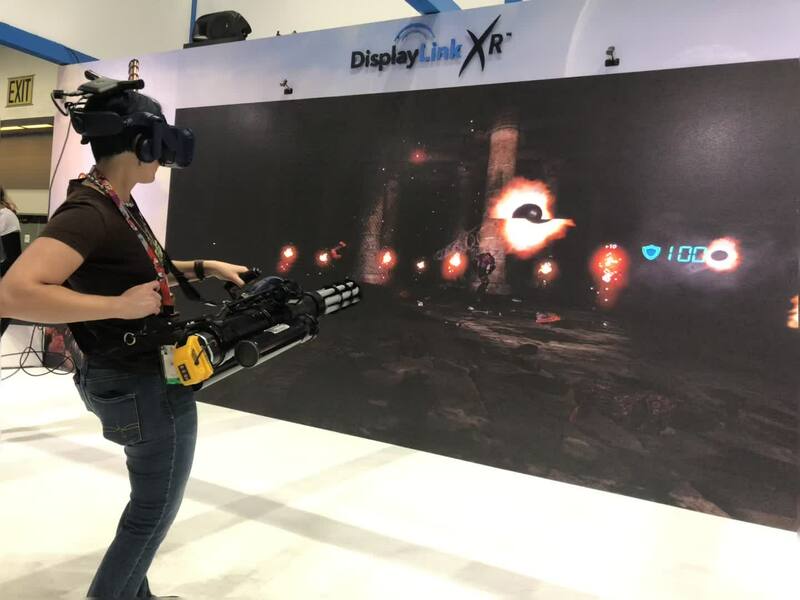 At E3, a pair of the adapters were shown wirelessly connected to Vive Pros alongside four of the 2.0 base stations tracking both headsets in a space roughly 25 feet-by-15 feet. In addition, a giant physical display served as a backdrop to the co-op Serious Sam experience players tried, complete with gigantic physical Gatling guns players held to mow down virtual enemies. Representatives of HTC and DisplayLink said that on a different day they had the entire space configured for a single player wireless game. What I tried, however, was the entire room split in half with two room-scale spaces for each player to hold their massive Gatling gun. I lost tracking once when looking at the ceiling (representatives suggested there was a lot of interference in the area) and I didn’t get enough time with the wireless system to feel like I could comment about the quality of the wireless streaming as compared to a wired Vive Pro. DisplayLink representatives wore shirts with text reading “You can’t be a badass wearing a leash.” That seems like a pretty spot-on sentiment about the limitations facing VR, as well as the potential for this technology if it works in large-scale spaces without any hiccups.